Various circumstances could lead to the loss of a tooth or teeth. Whatever the cause, replacement of a lost tooth is extremely important. Even a single missing tooth will impact the smile as well as oral health. Gaps between teeth may result in a shift that could throw off the bite as well as the appearance of teeth. This extra space allows bacteria to thrive, leading to an increased risk of tooth decay, gum disease, and potentially serious health conditions. Replacing lost teeth with dental implants offers a permanent solution with great benefits. Dental implants, which have been successfully used for many years, replace not only a lost tooth, but also the entire root system. This is achieved through the implantation of a titanium post into the jawbone. This portion of the dental implant procedure is performed by one of our oral surgery or periodontal specialists. It does take several months after this initial procedure for the jawbone to heal around the implant post, but the function and aesthetics that come from implants lasts a lifetime and impact no other teeth. The internal process that occurs after the implant is placed is called osseointegration, during which healthy jawbone grows completely around the implant post. As this occurs, the implant gains the supportive foundation needed for permanent placement. This new artificial root remains firmly in place, allowing the patient full access to the foods he or she loves to eat without concern that an artificial tooth or denture appliance will slip or fall out. A few months after the implant procedure, the patient returns to our office where we take an impression of the area to be treated. A dental crown is then fabricated in our reputable dental lab, and ready for placement within two weeks. 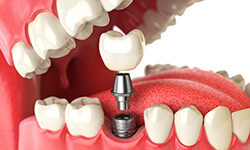 Dental implants are also an excellent alternative for the traditional denture appliance. Often used in conjunction with a denture, the placement of a few dental implants provides a high degree of security. For the denture wearer, implants bring about a drastic change in both form and function, resulting in a greater amount of comfort and confidence. For more information on dental implants, contact our office at (918) 528-7536. Dental implants, prosthetic tooth replacements, have been used in dentistry for over twenty-five years. Still, studies show that many people tend to consider conventional forms of treatment when faced with having to replace a lost tooth or teeth. Removable denture appliances, partial and full, and fixed dental bridges are tooth replacement options that do have merit. However, there is a significant difference with dental implants. This form of tooth replacement is the only way to replace missing teeth permanently in a fixed manner. Implants, which contain parts that lie both above and below the gum line, address more than just the appearance and function of a lost tooth. Being installed into healthy bone tissue, an implant will act as an alternative root. The significance of this is that bone tissue needs stimulation to remain fully intact. Without the stimulation of the natural root, or a suitable alternative, bone tissue will break down over time. This is true even with conventional tooth replacement treatments like dentures or the fixed bridge. When there is no stimulation of bone tissue, resorption will occur. Preserving bone structure with dental implants is an enormous benefit of this form of treatment, because once the bone is lost, grafting is required to build it back up again. This is especially significant when all teeth need to be replaced. Conventional dentures, sitting on top of the gums, often lead to a loss of facial contour, causing an aged appearance. Dentures are also a form of tooth replacement that cannot compare in the area of stability. Many denture wearers are now making the switch to dental implant-supported dentures, and discovering new-found freedom to eat, speak, smile, and laugh without concern over dentures slipping or falling out. With the stable support of implants, speech is improved, as are options for the enjoyment of food, since there are no dietary limitations. For the replacement of a single tooth or a few teeth, dental implants are a great alternative to partial dentures, which are often removable, harboring the same issues as a full removable denture. Implants are also superior to a fixed dental bridge, as it is not necessary to reduce healthy teeth in the replacement process. How much are dental implants from your Tulsa, OK dentist going to benefit you? When you take into account the preservation of jaw structure and facial contours, the restoration of full chewing function and a natural aesthetic, and the ability to smile with confidence, you might realize there is no better way to replace missing teeth than with implants. Contact Glisten Dental to learn more about dental implants.